Please click on the ^^^ above tabs ^^^ for more information. This page documents our solar cell project on our home in Boston Massachusetts which went online February 11th, 2004. A friend forwarded me an article from the Boston Globe newspaper (local copy) about solar power grants through Massachusetts Technology Collaborative (MTC) and the state. We immediately signed up for more information via the web, did some research, and got on their list. Our program is managed or sponsored by MIT but a number of companies in Massachusetts are installing systems under the MTC grant. Our system was installed by CSGS Renewables from Westborough, MA who did a good job -- although I don't have anyway of comparing their work or attention. Certainly they have answered all of our questions (and we've asked a ton), have been very flexible, contracted with good installers, and in general have been a pleasure to deal with. Unfortunately they may no longer be in the business of doing residential installations. The grant, from the MTC which is funded (I think) with public and private monies, is a 2 step process. They give an installation rebate which covered 1/2 of the up-front costs ($16k) and a production incentive of $0.38/kwh for the first 3 years of production (~$7k). The system would have been much more expensive and would have paid for itself only after 20 years without these grants. It looks like they are still accepting applications for new grants as of 1/2006. Here's the output from my perl monitoring scripts. You can click on the graph to plot other data fields or change the period. I try to vote with my wallet as much as possible. I make sure to pay for shareware, buy subscriptions to online news sources that I admire, certainly donate to political campaigns, and make other purchases as a way of donating and supporting organizations and causes. My Honda Civic Hybrid, for example, was purchased as a response to 9/11 and my view that Middle East oil either directly or indirectly sponsors global terrorism. With all that in mind, our investment in the solar panels was more a political and activist statement instead of a financial one. Keep that in mind. Here's our detailed solar spreadsheet courtesy of Google Docs -- uber cool. You can export it as a XLS or CSV file from there. The spreadsheet shows production, cost, revenue, and savings information. You are permitted to reuse this information (and any other information on these solar pages) as long as credit is given to Gray Watson and this URL is a part of all republication. Basically, our out of pocket is ~$19k initially (yes, a lot). Initial estimations said that after 3 years of rebates the system would have cost $9k with a break even of 13.5 total years. After 3 years of production information, our cost has been $9,556 with break even looks to be closer to 11 total years (2014) if all of the numbers stay the same. Certainly if electric power prices go up (and they are), break even would be sooner. The panels have a 20 year warranty and after 20 years the manufacturers estimate they will be generating 80% of installation production levels. Our system is called a "quad" system by our installer. They usually design systems with 12 (single) or 24 (dual) panels. The dual system is popular because it usually is the best fit for a family's energy usage. The numbers for the dual system are about half of the quad, with the same payoff rate since the yearly savings is halved. When comparing the single system, because the installation and equipment costs for the single system do not drop by half again, it costs about ~$3000 after 3 years and has a longer 13-15 year payoff time. One of the things that was confusing to Ro and I initially was how the yearly energy savings and the renewable energy credits can both be in effect. The system will be lowering our electric bill by spinning our meter slower (or backwards) on average every month. In addition we will be getting a check from our renewable energy credit purchaser based on how much energy we produce even if we end up using all of it inside of the house. The energy credits are sold to people who pay more to buy green power from the grid -- power from hydroelectric (mostly) as well as solar and wind plants. We are lowering our electric bills by $0.19/kwh and also getting paid $0.06/kwh for the green power that we produce. Here are some graphs showing our energy usage and savings with the solar system. The size of the system is very dependent on roof area and configuration. They need a relatively contiguous space to mount the panels, and easy access to go into the house to join up with the circuit panel. I'm sure they also need good line capacity into the house from the street and a newer circuit breaker panel to jack into. A roof with a southern exposure and a good downwards angle is optimal. Our roof faces ESE (130 degrees) with a tilt of 30 degrees. The tilt is good but the direction is not. Our installer expected us to get 80% of peak for our latitude with the system generating most of its output in the morning and early afternoon. If you are not facing south then a flat roof is better. Rain is no problem and will help to keep the panels clean so we shouldn't need to wash them much at all. The panels were installed over our current asphalt shingles and should probably give them a long life since they are intercepting the sun's rays. Although the tilt of the roof and the slipperiness of the panels will probably mean that most of the snow will slide off of the panels, if they are covered then output will be significantly reduced of course. Because of the dark color however, they should warm and melt off the snow pretty quickly. We got a lot of snow over the 2004-2005 winter and the panels did well. There were a couple of sunny days that were occluded by the snow but in general the wind would sweep the dry snow clear and a warming would cause the wet snow to slide off. The panels higher on the roof definitely did better since the snow tended to slide down and pile up a bit on the lowers. With one set of panels higher than the other, the snow would slide off the upper set first resulting in some strange power output. You may have noticed from my data that from May 1st to September 9th, 2006 I had a ground fault on one of my 2 solar array chains. My #6 inverter and 1/2 of my production was offline for 4 months -- ugh. Turns out that I had a squirrel nesting below my solar arrays and her 3 babies loved to chew on everything. They chewed on one of the supply lines which shorted out and blew the ground fuse on my inverter. After a busy summer I finally found the time to rent a cherry picker for US$363 for the day to pull 2 panels, find and replace the chewed wires, and prune the trees in the area so the squirrels can't get back up. So this cost combined with lost production of ~US$300 has set us back a year in terms of break even -- bleah. Solar cells convert sunlight (photons) into electrical power. On our roof are 48 solar modules, each producing 110 watts DC for a total of 5.28 kilowatts. Each panel is ~11 square feet or ~1 square meter (653mm x 1588mm) so our total solar panel area is ~520 sq feet or 48 sq meters. This DC or direct current has to be converted into AC or alternating current that is suitable to be connected to standard household appliances. Many solar systems charge batteries and feed DC systems directly but mine uses inverters to convert the solar output into AC which then plugs into "the grid". The grid is the organization of power generating facilities and distribution lines that keeps the electricity to our homes and offices flowing. There are no batteries or power storage mechanisms in the house. I've read that you can lose 50% of the solar output because of battery inefficiencies. The solar panel modules on our house are Evergreen EC100 units which is a Massachusetts company and MIT spin-off. Each module is made up of 72 solar cells which produce 110 watts. This means that with a 12 volt system it can produce 16.1 max volts and 6.84 max amps and with a 24 volt system it can produce 32.2 max volts and 3.42 max amps. The modules are wired on the roof in two sets in series each with 24 panels. They were installed right over the roof shingles using mounting rails screwed into the roof. As you can see from the below picture, a lot of wiring is needed to support the panels. The numbers on the picture have been added to assist in the identifications of the various components of the system. Click the picture for a larger version. Power comes down from the panels on the roof as two ~400 volt DC circuits (rated at 600v). That's the sort of voltage that can kill you. It passes through two pretty serious disconnect boxes. Then into the two Sunny Boy 2500U inverters which convert the DC power into AC. The inverters use the line power to sync up the phase on the AC and will shut themselves off if the solar output drops off or the line power cuts off because of a disconnect or a blackout. I am monitoring the inverters via serial ports to my server and I have the graph output online. The output from the inverters gets joined into 2 in-phase 110 volt AC circuits by a combiner circuit-breaker box. It then goes outside to an external disconnect box used if the power company is working on the lines or if there is a fire and they need to disconnect power from the house. The power then comes back in to an electric meter which has been augmented with a sensor on the kilowatt dial. The sensor is monitored by a special sensing box developed by CSGS who managed the installation. This box uses DHCP and connects into our home network. It pushes data via the web to the online site for recording how much output the system generates. The output from the electrical meter then runs into our circuit breaker box and taps into the two 110 volt circuits in the house. Even though we have solar panels on our house, we cannot disconnect from the grid and cannot turn on lights when the grid is down. 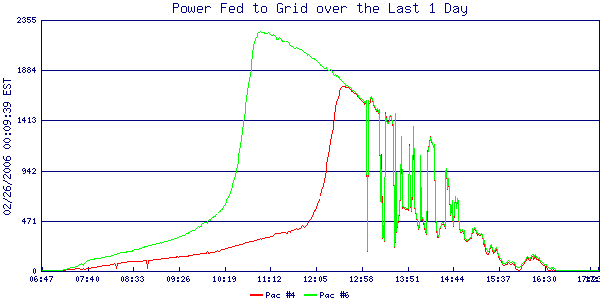 The inverters need the grid to sync up the 60hz signal and while we are connected to the local grid, we would be browning the local neighborhood if they didn't shutdown. So what happens if the Sunny Boys are supplying more power than the house is consuming? In this case the AC voltage will begin to climb as the Sunny Boys will push all of the power that they have available against the impedance of the house circuits. So why does the AC voltage climb and not the AC current? This is because the Sunny Boy Inverter is a current source device, essentially it will push current against the AC voltage waveform provided to its AC inputs. So the AC voltage begins to climb, and if it gets high enough ~259 to 260 Vac, then the inverters will click off line and you have lost all of your power production for five minutes as they cycle though their "countdown" routine. This may not be too much of a problem if it happens once or twice, but it could be a serious problem if this is happening 6 to 10 times an hour for several hours. If you find that this is the case you may want to include some kind of dump load, like a space heater, to handle the excess production from the Sunny Boys. The problem is how to manage the output from the solar arrays compared to the load from the house. If a cloud goes over the sun, the output could drop precipitously and brown out all of your appliances. If the solar output to too much for the house, the AC voltage will climb and all of your appliances will either blow internal fuses or burn up. It turns out that SMA's Sunny Island product is effectively a UPS coupled with a controller which monitors the input voltage to the system and regulates the output from the Sunny Boy inverters to not overwhelm the UPS. They use the CMD_PDELIMIT (0x28) command to limit the output from the inverters to an relative or absolute percentage to control the voltage to the system. I'm interested in programming this for my system. I have a number of UPS units and can see a program which monitors the voltage of the inverters closely and regulates their output. The big question is how to plug the system in so the UPS tricks the inverters to think that the line is operational but allows the UPS to charge from the inverters. It may not be possible. I doubt that the UPSes can stand having something push voltage at them from the load side of the fence. If you have any ideas or have a contact at APC or any other UPS engineers, please let me know. Here are links to other folks out there like me who have a solar house. For every link there are many, many others out there. Please send me mail to have yourself added to the list. John has a cool solar installation with PV being monitored with my scripts as well as solar hot water. David has a really cool house with PV, solar hot water, solar air heating, and wood gasification furnace. Bob is using my perl scripts to monitor his solar array on his house. Joel Parks has a 2.4 kw array of solar panels on tilt mounts so he can orient it for the angle of the sun. Although Jim Baber's solar house site is a bit confusing, his array is stunning. It completely covers his house. He has some numbers and yield results as well. Jim Krutzler's got 2 PV systems (7kw and a 3kw) and another hot-water solar system that he detailed on his madpower.com site. He's trying to get his PV systems online and monitored. Frank Evans and Susanna Gross are utilizing both passive and active solar to heat and power their house in Colorado. They have graphs of the solar thermal data and their PV output online. Very, very cool design and implementation. The Compaan family has a solar house in Toledo, OH and an electric car. Bill and Debbi Lord have solarhouse.com domain for goodness sake. They have a beautiful house in Southern Maine. Liz Seiberling and Randy Cullom have built a very beautiful solar home near Gainesville, FL. They have a lot of plans and other information including stuff about composting toilets.